I used a 1/4 inch round metal file and slowly filed the dropouts. Filing vertically upwards on the dropout tips the top of the wheel left or right and filing backwards moves the front of the wheel left or right (depending on the side you file, pretty simple) This allowed me to put the wheel back into alignment. Luckily this has not been a problem with my frame. But I saw this on instructables.com and I thought the lessons might be useful. 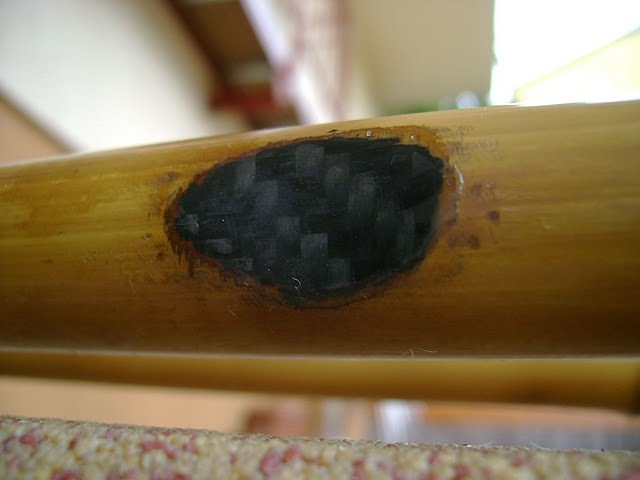 Below we can see a crack that formed when clamping the seatpost directly to the bamboo seat tube. The main lesson here is that bamboo is only strong in certain ways. Think about a bamboo pole in a grove somewhere, if the force is non-natural (horizontal compression) your bamboo will likely give out on you. I think the kid here did the right thing more or less. First he drilled a hole (ideally at the base of the crack) to alleviate pressure. Then he used his resin and hemp fiber to reinforce the whole crack (not shown here). My guess is that it worked for him. Although under this circumstance he could have cut the top of the pole down more and put in a metal seat tube collar. The good news it seems is that most cracks can be repaired with some resin and fiber. I have read one or two instances where calfee patched a frame this way, so you have to assume that it works. You might consider injecting some thicken epoxy inside of the tube also, if possible. This surely would alleviate most of the stress on the area. 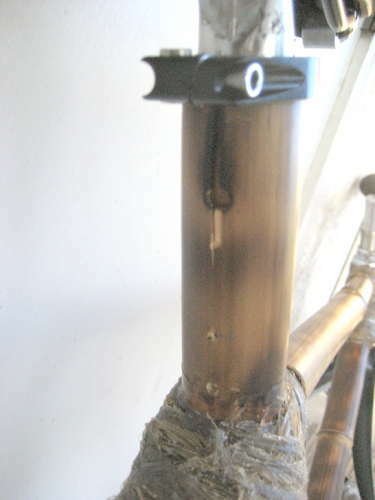 Another fix option was used by a reader “Kobike” to fix a blemished pole. The carbon patch is likely the best possible fix. Check out other pictures from Kobike http://picasaweb.google.hu/bamboobikeboy/BamboobikeS2?feat=directlink#. Looks like a beautiful bike. Although immaculately built I have one concern for Kobike’s build. All the hemp fibers appear to be lined up in one direction. Although its not a death sentence of an sort, with a unidirectional matrix (as shown above) there is nothing to keep the epoxy holding individual fibers from tearing apart. Use multiple layers with fibers oriented in different directions to maximize the strength of your joints. Another really good material is carbon fiber tow… super strong, but nasty to sand. I used it as a base layer for my lugs and laminated strips of it on the bottom of my chain stays for rigidity. After that I built up the hemp lugs. Wow thats a really good idea. I was looking into carbon fiber as a base-layer but its too damned expensive… tow seems much more reasonable. I wonder if you might have the time to talk at a sustainable event I’m planning as a last semester student project at Berklee College of Music. The event is about making the music industry sustainable and the various ways that we can management our carbon emissions. I’m still in the planning phase and seeing who is available for Tuesday Nov 16th, 7-9pm. If you’re interested please contact me. I would love to speak with you more about the various projects that I have underway and the very exciting things that you’re doing. Oh.. and by the way the bikes are brilliant! My name is Landon Friend. I am a student at Cal Poly San Luis Obispo State University in California. A year ago a friend and I were in Independence Belize building a dental clinic and while there we began to see the necessity of “transportation.” The majority of the labor force who worked with us traveled over an hour each morning with three people on a single bike just so they could work on the dental clinic. They woke up before sun rise and left the job site after it set. After a few weeks we thought, “what if everyone had a bike?” How much more could their business grow, how many more services could they have access to, and how much more could cultures interact. Upon returning home we decided to start a bicycle company: “Echo Bicycles” with the core DNA being “giving.” For every bicycle we sell we give another to someone in the world who needs one. In other words, every purchase has an echo. Essentially, it is a one-for-one business. 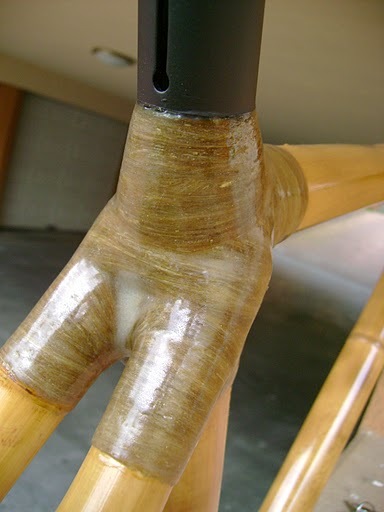 We want to make the bicycles frames out of bamboo and our target market will be young urban professionals, the environmentally conscious, and/or college students to begin with a price point between $300-800 (and that to cover the cost of the one we give away). Do we sound crazy yet? We are in the beginning phase of research and design and I’m wondering if you may be interested in contributing. We are young, broke entrepreneurs, and crazy enough to believe we can change the world, but I have never made a bicycle, I ride them and I have a vision. With that said, we have a hole: we need a bike maker. At this point we are working for free and cannot pay you for your service, but I promise you there is a greater joy in giving even after Echo Bicycles begins to make a profit. I believe a simple mode of transportation can change people’s live, I believe a purchase of a bicycle “here” can have a resounding echo “there,” and I believe your help can do the same. If you are willing, I would love to chat with you more. My contact information is at the bottom. I was just wondering if there is any chance you have a manual (a line drawing in black and white) of how to make a bamboo bike? If no, then maybe you know anyone who could help me??? Hey, built a bamboo fixed gear bike this summer. After about 125 miles the joint at the seat tube and bottom bracket cracked. The bike is still rideable, in fact, it may have taken me a while to realize if it weren’t for the obvious noise it made. I plan on trying to replace the seat tube with a spare piece I have. I was wondering if you or anyone here has ever taken apart a joint to do a similar repair. I’ve heard of using a heat gun to soften up the epoxy but I’m worried that the heat may negatively affect the remaining bamboo poles. Any advice is appreciated, and I can definitely send you the pictures of the repair process. It would be great if you could post the pictures of the crack and post some comments on how the repair process goes. I was thinking that your best bet might be putting a carbide grinding bit and grinding it away slowly. I would stay away from softening the epoxy. Good luck! Unfortunately, as you can see at the end of that album, after about 90km, two of the joints developed major cracks. I’m not sure why. I had one minor crash which may have been enough to initiate the crack at the head tube. Perhaps the cold weather affected the epoxy? It’s frustrating that I can’t get this bike to work. I think I need to start from scratch and build a new one but I don’t want to run into the same problem.